I am not a huge fan of “world” music. To me, even the name is a misnomer, as if the listener and their respective cumulative cultural experiences were one set of phenomenon and the entire world is placed on the other side. Furthermore, much of “world music” is extremely bland, with many playing up preconceived expectations so prominently that no motivation beyond the need to make a quick profit (hence why they are thankfully imprisoned in dollar stores and seldom perused bargain bins). What’s worse: often the so-called world music will not even be truly representative of the culture attempting to be presented, thus throwing any possible sincerity out the window. 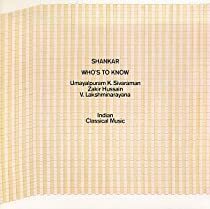 None of this applies to the “Who’s To Know?” album by Lakshminarayana Shankar (not to be confused by the similar Ravi Shankar). This is for several reasons. One being that, while Shankar is described as an “interpreter” of Southern India music, he and his collaborators play the album with a commendable zeal and passion. Composed mainly on a “ten string, stereophonic double-violin” (supposedly an instrument he invented and designed himself), the instrument accounts for about 85% of the string sounds, as it is noted as having a highly expansive range of sound that is able to be produced. Shankar is accompanied by two additional musicians, credited as playing ‘regular’ violin, tabla percussion at points, and consistent tamboura drones. Both tracks are very long tracks, running twenty-eight and twenty-three minutes respectively (I hesitate to call them “ragas”, as he uses a different tuning from traditional Indian music and they are not specifically referred to as such as far as I can tell). Yet this does not detract from how awesome this release is. You would think that the extreme length of the songs would repetitive by their nature, but this fortunately not the case. Although there are familiar themes that re-appear at points throughout the song, there are also many long-form solos from the various instruments themselves, in a bewildering variety of styles. The music, while being active, also is very powerful in lulling the listener into a state of peace and tranquility. In short, an intense and powerful performance by incredibly adept and skilled musicians. Highest recommendation. ~ by John Lithium on July 30, 2007. This entry was posted on July 30, 2007 at 11:38 pm and is filed under Music For The Rest Of Us Archive, violin, world music.You can follow any responses to this entry through the RSS 2.0 feed.You can skip to the end and leave a response. Pinging is currently not allowed. Previous: An apology to Death In June, Tony Wakeford, and "Alwc"